← Londei’s London shops. Photo & text: John Londei (2/3). 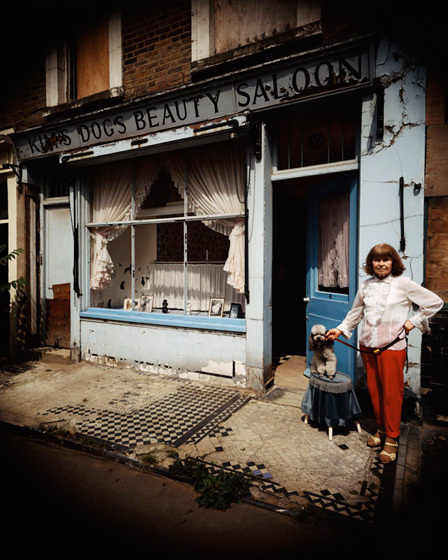 Kim’s Dogs Beauty Parlour, 4 Bristol Gardens, Notting Hill, 1984. © John Londei. To her customers Freeda Lizetta Regina Sophia Carson was simply known as ‘Kim’. As the dog’s coat grew it became progressively shabbier. “I had no idea what to do. Eventually he had such long hair I taught myself to clip him.” And so began a lifelong career. Freeda got a job at Bellmead Kennels in Windsor and in 1955 she opened her salon in Maida Vale. Ironically it used to be a butcher’s shop.